Rabbi Shraga Simmons offers a deeper meaning: "We are taught that it is an act of ultimate kindness and respect to bury someone and place a marker at the site. After a person is buried, of course, we can no longer participate in burying them. However, even if a tombstone has been erected, we can participate in the mitzvah of making a marker at a grave, by adding to the stone. Therefore, customarily, we place stones on top of a gravestone whenever we visit to indicate our participation in the mitzvah of erecting a tombstone, even if only in a more symbolic way." Rabbi Ovadia Yosef says this, "In former days one did not mark a grave with marble or granite with a fancy inscription, but one made a cairn of stones over it. Each mourner coming and adding a stone was effectively taking part in the Mitzvah of matzevah ("setting a stone") as well as or instead of levayat ha-meyt ("accompany the dead"). Of course, the dead were often buried where they had fallen, before urbanization and specialization of planning-use demanded formal cemeteries...Therefore in our day one tends to stick a pebble on top of the tombstone as a relic of this ancient custom, and it is still clear that the more stones a grave has, the more the deceased is being visited and is therefore being honored. Each small pebble adds to the cairn - a nice moral message. This has become slightly spoiled by the cemetery authorities clearing accumulated pebbles off when they wash down the gravestones and cut the grass." Finally, Rabbi Andrew Straus offers the following: "Ritual is a way of expressing our emotions and spiritual needs. We need physical acts to express these things for us, to make them concrete. Placing a stone on a grave does just that...(1) It is a sign to others who come to the grave when I am not there that they and I are not the only ones who remember. The stones I see on the grave when I come are a reminder to me that others have come to visit the grave. My loved one is remembered by many others and his/her life continues to have an impact on others, even if I do not see them. (2) When I pick up the stone it sends a message to me. I can still feel my loved one. I can still touch and be touched by him/her. I can still feel the impact that has been made on my life. Their life, love, teachings, values, and morals still make an impression on me. When I put the stone down, it is a reminder to me that I can no longer take this person with me physically. I can only take him/her with me in my heart and my mind and the actions I do because he/she taught me to do them. Their values, morals, ideals live on and continue to impress me - just as the stone has made an impression on my hands - so too their life has made an impression on me that continues." So do all these explanations mean placing a rock on a tombstone is only a Jewish custom? While I would consider it likely when visiting a gravestone with rocks placed on it, it may not always be the case. Cemetery symbolism author Douglas Keister reminds us, "In Christian lore, rocks are a powerful symbol of the Lord." There are many places in the Old Testament Bible that compare God to a rock. One being Psalm 18:2 -- "The Lord is my rock, and my fortress, and my deliverer, my God, my strength, in whom I will trust, my buckler, and the horn of my salvation, and my high tower." So the placing of a rock on a tombstone could represent a belief that the deceased is with God. Keister further states, "In almost all cultures, rocks represent permanence, stability, reliability, and strength." All in all, placing and finding rocks on a tombstone is a nice tradition. Whatever the culture or religious faith, the rocks represent an honorable memory of the deceased. 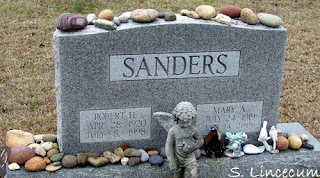 Note: the photo above (© 2009 S. Lincecum) is of the gravestone for Robert H. Sanders (28 Apr 1920 - 8 July 1998) & Mary A. Sanders (24 July 1919 - 14 Jan 2006) at Roberta City Cemetery in Crawford County, Georgia. A very nice article, indeed! Thanks, Stephanie for writing this and thank you to Minda for mentioning it to the interview_taphophile group. Here in BC people paint small rocks with scenes and animal images and with First Nations art too. Those would also be nice to leave after visits as would some 'pretty' pebbles. My mum might have liked to have a 'frog stone' - she liked frogs. Maybe I'll leave her one soon. Just read your interesting article today. Another reason for the stones at the grave could be that stacking the stones on the top protected the deceased from wild animals. Keep adding stones to help protect your dead from desecration. ??? Thanks for the article. Answered all my questions. I believe the tradition does provide a bit of comfort to the visitor, Fran. Hope you enjoy your visit, and I hope your father is resting peacefully. Recently, I got to thinking about how much I like stone and thought of how nice it would be to have loved ones drop stones on my grave when they visit. I had NO IDEA that this was even "a thing!" Imagine the sweet surprise when I found this article!!! I just told my kids and I just posted this to my Facebook page. You are quite welcome, Randall! Thanks so much for sharing and taking the time to comment.